On April 18th I wrote about potential weakness in Apple on an absolute and relative basis after the stock confirmed a failed breakout. The stock has crashed almost 20% since, but the tactical bias is now shifting to the upside for the same reasons. Here’s a hint, it has nothing to do with Warren Buffet, 13F filings, or Apple’s billion dollar investment in Didi Chuxing. The daily chart of Apple (AAPL) provides a tactical view of the failed breakdown that’s confirmed in the stock. On Thursday May 12th Apple closed below the February / April lows near 92, but quickly recovered back above that level as well as the downtrend line from the April 27th highs to confirm the bullish momentum divergence and failed breakdown. 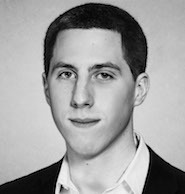 As the action in the stock over the past month has exhibited, failed moves tend to lead to fast moves in the opposite direction, especially when combined with a momentum divergence. The current weight of evidence suggests that as long as prices remain above 92, there’s absolutely no reason to be short AAPL on an absolute basis. If you’re looking to participate in the stock, I think there are three ways to do so in a way where risk is well-defined while keeping the risk/reward skewed in your favor. Trading AAPL on the long side against the 92 with a price target near 104. This level represents the mid-March gap to the upside, as well as the late-April gap to the downside. Shorting shares of Apple on a close below 92, with a downside target near the recent lows or somewhere just beyond down to the April 2014 gap and 161.8% Fibonacci extension of the February-April counter-trend rally near 80. Remaining neutral on AAPL and shorting strength toward 104 and the downtrend line from the July 2015 highs for Apple stock. 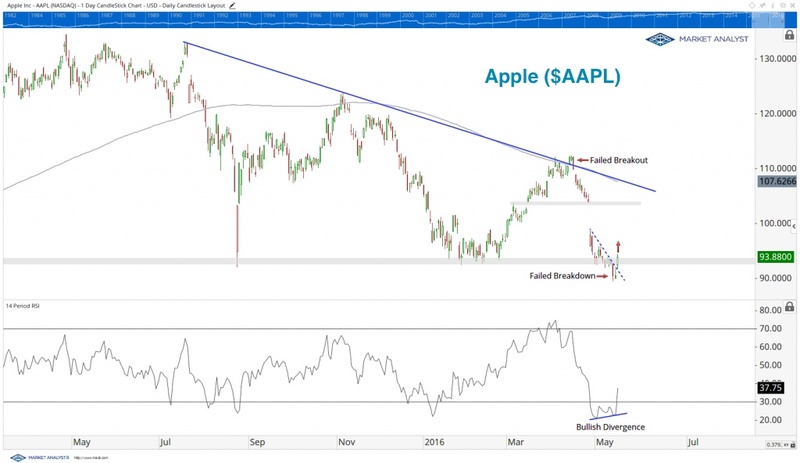 The Bottom Line: Apple is in a long-term downtrend, but the current weight of evidence suggests a counter-trend rally may be in the cards over the short-term. As long as prices remain above the February / April lows near 92, the bias remains to the upside and there is no reason to be short. Thanks for reading. As always, if you have any questions feel free to reach out and I’ll get back to you as soon as I can. The author does not have a position in any of mentioned securities at the time of publication. Any opinions expressed herein are solely those of the author, and do not in any way represent the views or opinions of any other person or entity.